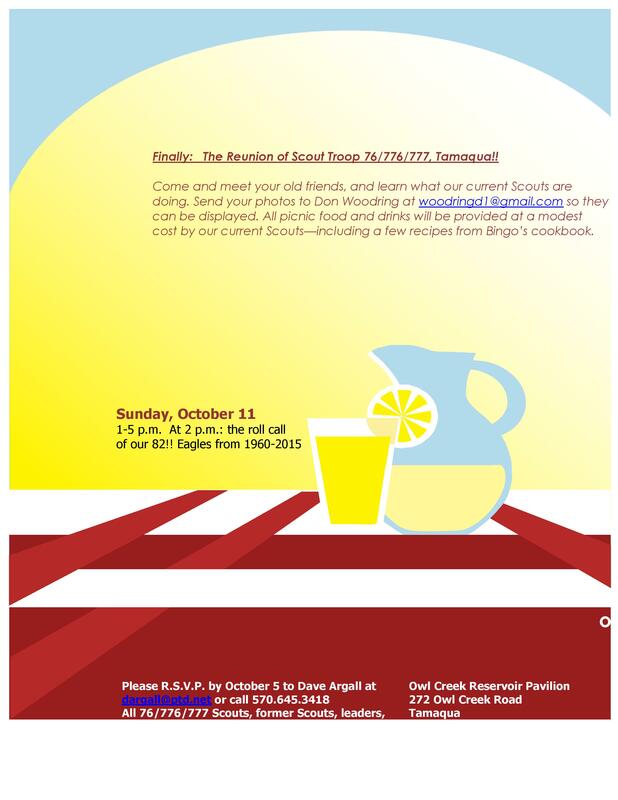 PRESS RELEASE – (from David Argall) – All former and current members of Tamaqua Boy Scout Troops 76, 776, and 777, sponsored by Zion’s Evangelical Lutheran Church and St. John’s United Church of Christ since 1960, are invited to attend a special reunion picnic at the Owl Creek Reservoir Pavilion on Sunday, October 11, 2015 at 1 PM. The troop’s goal is to have as many current and former scouts and leaders together as possible in its long history. At 2 PM, the roll will be called of the Troops’ 82 Eagle Scouts from 1960 to 2015. The troop is now compiling an updated mailing list to send the invitations. Anyone knowing the current addresses of former Troop 76/776/777 scouts and leaders who may be in interested in attending the picnic reunion is urged to call Dave Argall at 570-645-3418 or dargall@ptd.net. The event group page is also on Facebook at https://www.facebook.com/groups/866984180050869/.